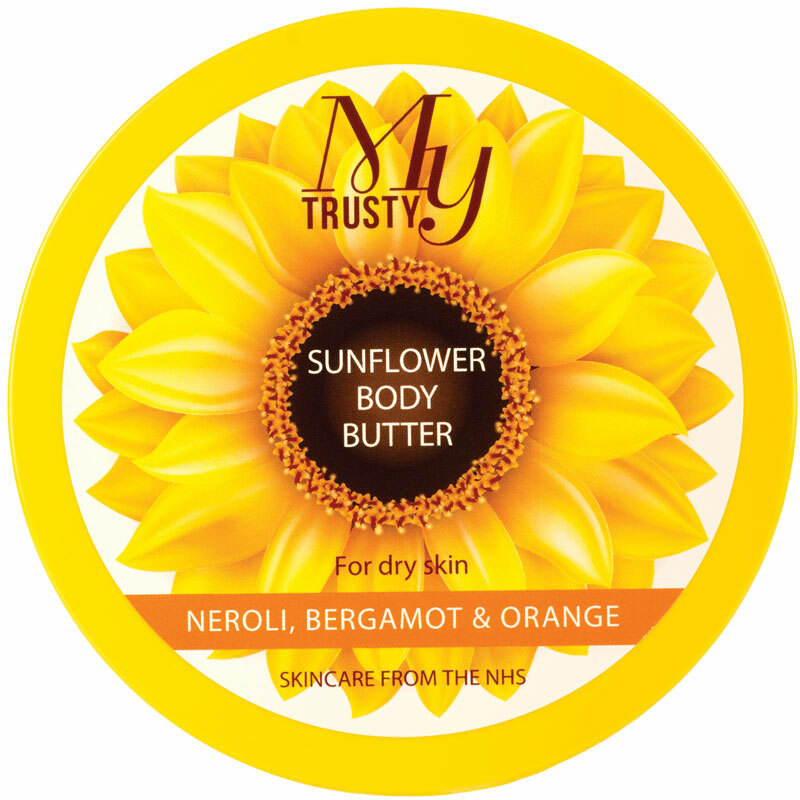 NHS Skincare, My Trusty, Sunflower Body Butter (200 ml) is an intensive moisturiser, blended with shea and cocoa butter, fragranced with natural oils of neroli, bergamot and rosemary. Rich in essential skin improving vitamins E, F and K, this protective formula, will soften and nourish even the driest areas. 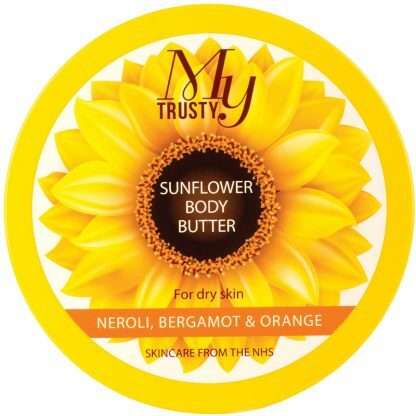 NHS Skincare, My Trusty, Sunflower Body Butter (200 ml) is an intensive moisturiser, blended with shea and cocoa butter, fragranced with natural oils of neroli, bergamot and orange. Rich in essential skin improving vitamins E, F and K, this protective formula, will soften and nourish even the driest areas. 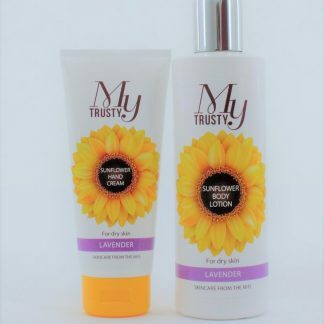 With naturally active sunflower oil, our rich formula is perfect for deep moisturisation, especially on rougher areas of the body including knees, elbows and cracked heels. Suitable for people of all ages. ‘Freefrom’ lanolin, parabens & SLS. Clinically proven & dermatologically tested to help soothe dry itchy skin that may be prone to eczema, psoriasis and improve blemishes, scars & stretch marks. Thank you so very much. Natural products too, Wow! The best I have ever used. Absolutely love it. No nasty ingredients either. Beautiful silky cream. I love the texture of this cream and the way it goes on. My hands really suffer but after I’ve put this on they feel hydrated and look and smell fantastic. Great that it doesn’t have lanolin in too! Luxurious and nourishing. It’s my treat at the end of a long day to massage it into my feet. Smells gorgeous. Feels amazing. I also do reflexology and Physiotherapy – and some clients regularly bring this along in preference to my massage oils! 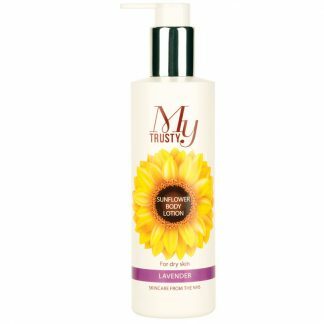 A fantastic product – smells wonderful, has a lovely texture making it so nice to use but, most importantly, it really works. Hours after application, my very dry and mature (!) skin still feels soft and velvety. No other product I’ve tried lasts as long on the skin and has such a hydrating effect long term. The body butter is proving to be a very effective and long lasting treatment for the dry skin on my lower legs. It’s easy to apply and is rapidly absorbed. A great product! The body butter is a fantastic alternative to the harsh steroid creams I am prescribed for my psoriasis. I use it at night on my legs, feet, torso and elbows to keep the areas soft and supple which stops the intense itching and helps prevent the skin from cracking. It is easy to apply and thicker than the lotion – which is brilliant for my extra dry skin as I need it to last longer on the surface. A lovely product that melts into the skin. Feels very comfortable. Stops my legs from being sore post shaving – and does not sting. Use it all the time. Fantastic on my feet and legs – especially my heels. I put it on at night and they are so smooth in the morning. Body Butter – It is absolutely gorgeous, soft, creamy, looks, feels, smells good enough to eat. it definitely feels just like soft butter. Skin feels so soft after use. 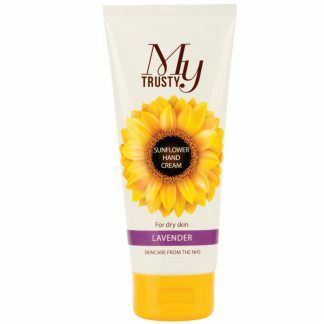 The My Trusty body butter is a delight to use, nourishing and very pleasantly fragranced. 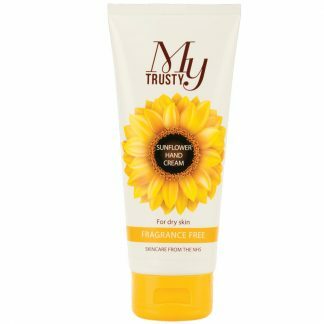 This product has helped to improve the appearance of the eczema on my legs quite significantly. An excellent product with an equally excellent price ticket.